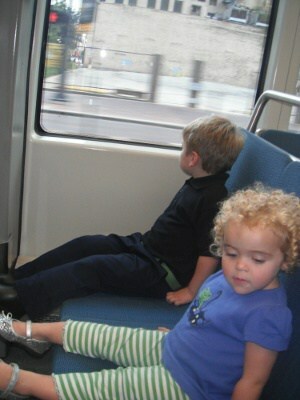 Update: Go HERE for the latest METRORail post… including a video on how to ride METRORail with kids! Cost: Adult one-way ticket is $1.25. Children under five ride free. Our Review: In our house, trains are only second to firetrucks. Since we don’t have many chances to ride around in a firetruck, we decided to take a ride on the METRORail. 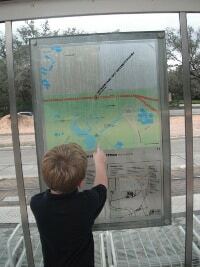 My kids and I parked at Hermann Park, in the free 3 hour lot, and walked the short distance tot he Hermann Park rail station. 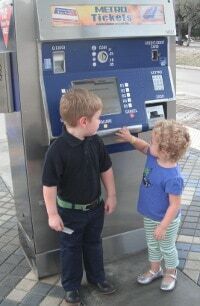 At the train station, there were 2 easy to use kiosks where we purchased one ticket with a credit card. An adult one way ticket is $1.25 and my kids, since they are under 5, were free. Once we had our ticket, we just jumped on board the next train. No one checked our ticket, but METRO has random inspections and if you have not paid the proper fare, you could be fined up to $500. Go HERE for details. There were a lot of people on the train on Sunday afternoon, but we found seats easily. My kids were excited to look out the windows as we traveled from Hermann Park to Downtown. We exited at Main Street Square and I was surprised at how nice of an area it is. We stopped to eat lunch at Bombay Pizza Co., where we sat outside and watched the trains go by, and then walked north a few blocks. At Preston station, we bought another $1.25 ticket from the kiosk and boarded the southbound train. This was a really great 2 hour outing with my kids. I couldn’t believe we had not done it until now. 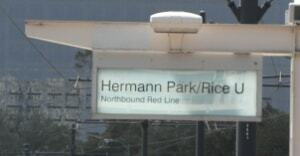 Next time we might go all the way to Allen’s Landing… or maybe we’ll ride the METRORail and then catch the Hermann Park train… or… There really is a lot to do in this part of Houston! Can u purchase a ticket cash? What train does one take to get to chase tower in downtown houston? I live in jersey village. Also, please be clear how one gets back to where one started. I want to see the tunnels as well. Same train?